Great Mother’s Day gift idea! Get some pretty buttons to match mom’s favorite outfit and make them into a beautiful bracelet. Collect pretty buttons and string them on elasticized cords for stretchy bracelets to be given as gifts. 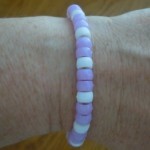 Beads are an inexpensive craft supply so these beaded bracelets are great to make with a large group of children. 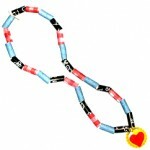 The children will then have a wonderful gift to give to Mom, grandma or a special aunt. 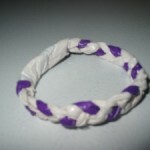 Many things can be made from duct tape like this duct tape bracelet. Great gift idea. Learn the weaving technique to make these beautiful bracelets. Great gift idea for friends and for Mother’s day. 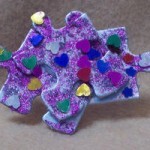 Do you have left over puzzles pieces laying around? 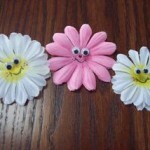 Recycle them into pins for Mother’s Day or anytime you want to give a special gift. You can make custom jewelry with modeling clay. 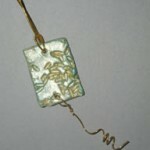 Make mom a pendant she will cherish forever. This friendship necklace technique is really easy, and versatile! 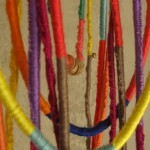 You could easily use this same string technique to make a friendship bracelet, embroidery thread anklet or to wrap your hair in. Have you been looking for a gift idea for Mother’s Day, look no further. 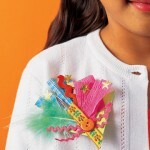 Mom and/or grandma will love this fancy brooch. Bring springtime to your mother with this happy little pin. She will want to wear it all day. Use leftover coordinating patterned scrapbooking paper to roll into beads to make necklaces.